﻿A new generation of pallet stretch wrapping machines, both semi-automatic and fully automatic, designed to reduce packaging, waste and maintenance costs. 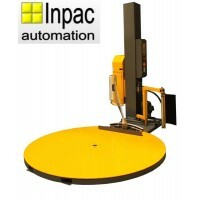 Semi automatic turntable pallet stretch wrapper machines (sometimes referred to as "Spin Wrappers" or "Shrink Wrappers) represent the entry level for many applications. The load is placed on the pallet wrapper turntable, by pallet truck or forklift truck, and the stretch film is attached to it. The operator then starts the machine's wrapping process. At the end of the cycle the operator simply cuts the film and removes the load. Various turntable and mast sizes are available, enabling the customer to choose the most economical solution to suit the range of likely loads. A version using Siemens S7 PLC and Touch Screen control is available for those users needing extended wrapping flexibility. Mechanical core brake, electromagnetic core brake and power pre-stretch film carriages are available, again enabling the customer to choose the most economical solution for his application. For high usage machines it is not uncommon for the film savings associated with power pre-stretch to enable a machine “pay-back” time to be measured in months. An option is available incorporating an automatic film cut and grip mechanism which, coupled with a wireless remote control, enables the wrapping process to be carried out without the operator needing to leave the forklift truck. For high volume sites a single remote unit can be programmed to control more than one pallet wrapper. Other options including loading ramps, pit mounting frames, pneumatic top clamps, up to 3m diameter turntables, up to 4m pallet height, flat load wrapping (e.g. doors), stainless steel construction, hazardous area certification and weighing scales are also available. Fully automatic pallet stretch wrapper machines are normally integrated into an automated production line and, to facilitate that integration, our control panels are designed to enable easy interfacing with external conveyor control panels. All Inpac fully automatic pallet stretch wrapping machines feature Siemens S7 PLCs as standard although other manufacturers’ units can be fitted to suit customers’ requirements. Touch screen user interfaces are provided for setting wrapping parameters, monitoring progress and diagnosing alarms. Power pre-stretch film carriages are fitted to ensure economical film use. Automatic top sheet dispensers and top clamp load stabilizers are available as options to increase the machine specification flexibility. 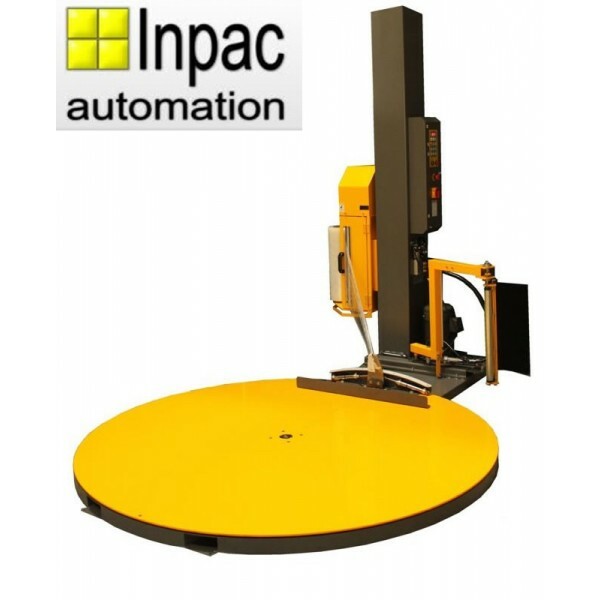 Inpac fully automatic pallet stretch wrapping machines are available in three ranges; turntable, rotating arm and rotating ring, all of which are normally supplied with purpose built safety fences and light curtain style personnel barriers. The turntable range is suitable for up to 40 pallets per hour. The palletised load is delivered by the infeed conveyor to the conveyor topped turntable where it is centralised before being rotated for the wrapping process. At the conclusion of that process the load is fed to the discharge conveyor for transport to the pallet storage or handling areas. The rotating arm range is suitable for up to 70 pallets per hour. Unlike on the turntable range, the pallet does not rotate during the wrapping process but remains static on the conveyor. A counter-balanced arm moves the film carriage and vertical mast around the load, the carriage moving up and down the mast to suit the selected wrapping pattern.